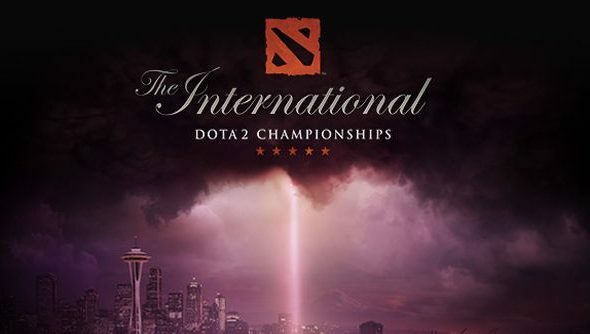 The Dota 2 International main event kicks off in just under an hour, and it’s set to be the biggest eSports event in history. A record-breaking prize pool that dwarfs some of the world’s most popular sports like The Masters, and just a whisper away from that of the NBA. Eight prestigious teams from around the globe will fight between a crowd of 17,500 at Seattle’s Key Arena. And if you think it stops there, you’re in for a loud surprise. Valve are going to release the second most anticipated thing next to Half Life 3. The main event will take place over four days, starting Friday at 9am PDT and 5pm BST. It’ll be separated into matches from the upper bracket and lower bracket to determine who plays in the grand final. Matches prior to the grand final will be best of three, while the grand final itself will be a best of five. The tournament begins here with the two top teams from the playoffs, EG and ViCi, as well as the two teams that made it through to the end of phase three, Team DK and NewBee. Sights are certainly locked onto EG, who are America’s last hope at claiming the title. Their performance so far has been promising to say the least as they went 11 wins to 4 losses in the playoffs, securing their place in the upper bracket. But it shouldn’t be overlooked who they’re up against: three of China’s finest teams. Their match against DK will be tough, especially considering they were one of the few teams to beat EG in the playoffs. Even if they do manage to overcome the might of DK, they’ll then have to face the victor of the match between NewBee and ViCi. Holding back here on super secret strategies to use in the final could see a team in the lower bracket. Every team means business and I daren’t say who I favour on succeeding. What I can confidently predict however is that we’ll see some of the closest matches in professional Dota. 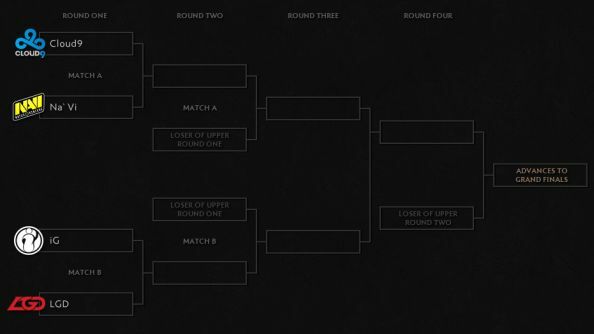 The lower bracket: the last defence before the threat of leaving the tournament becomes a reality. Even some of those in the safety of the upper bracket are destined to spend some time here. On the bright side, each team here is walking away with a minimum of $500,000. First up is Cloud9 vs Na’Vi, the latter being seasoned veterans when it comes to these Dota 2 International events. 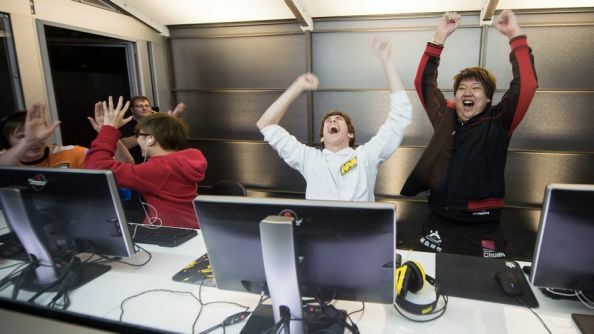 Na’Vi won the first one back in 2011 in Germany, and have made it to the finals in every International since. While their playoff performance wasn’t anything to write home about, they still command huge respect throughout the Dota community. Cloud9 – who are competing in their first International this year – have their work cut out for them. 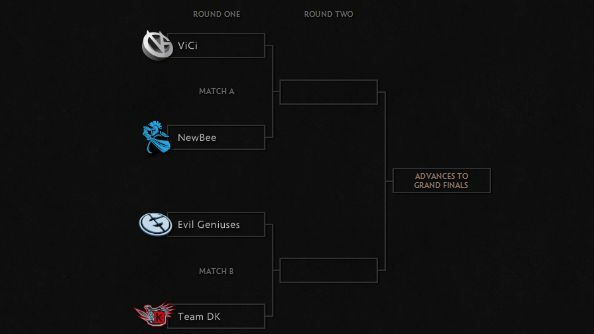 But if they can beat Na’Vi, then there’s no doubt that they have a shot at going all the way and claiming the trophy. In the next matchup we have 2012 champions iG against LGD. It’s clear that this year’s International has been heavily dominated by the Chinese, and in this particular matchup there’ll be no mercy. iG desperately want to maintain their claim on the International championship, and prove just like Na’Vi that they aren’t one trick ponies. Meanwhile LGD – who didn’t even make top 8 last year – want to get revenge on iG who knocked them out of a place in the finals back in 2012, resulting in LGD settling for third place. Every year the players briefly forget about the pressures of a multi-million dollar tournament, and just have a less than serious game of Dota 2. The All-Star match is a community-picked clash of two random teams consisting of those competing at the event. It’s a game that no one really cares about the outcome, but rather the crazy strategies and plays that occur. It’s always a pleasure to watch. The players will pick the most popular heroes with mostly skill shot abilities. There’ll be level one Roshan attempts that end up with nobody winning. You’ll see crazy ganks that extend far deeper into enemy territory than any professional game would dare to attempt. It’s all just for fun, and it’s a nice break in the event. The All-Star game will occur towards the end of Saturday, after the bracket games have been completed. Don’t miss it for the world. While I can’t really comment on what you can expect from day three and four (because we don’t know who’s playing), I can talk about the next big thing that’s going to cause ripples throughout the Dota 2 community: Techies! Techies are by far the most infamous hero in Dota; the community has been calling for their release ever since Dota 2 hit beta. They’re an interesting hero: they have little direct combat ability, instead dealing their destruction through very dubious means. They can litter the battlefield with dozens of landmines, remote mines and traps. They can put down over 77 mines at once all over the map. Oh, and they’re all invisible. The fun doesn’t end there either. 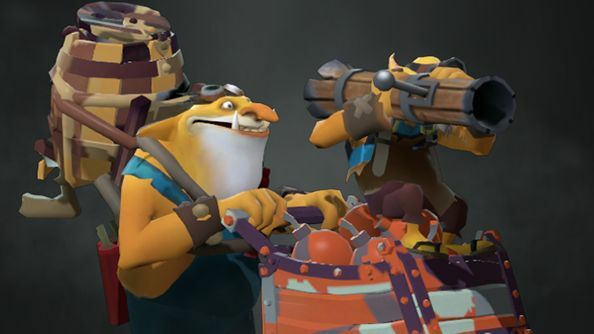 Accompanying their arsenal of explosives, Techies can at any time blow themselves up, causing huge damage in a large area of effect, while also denying their enemies any gold and experience gained for their death. Their death time is also halved when they use the ability. Valve have already stated that Techies will be released “shortly after the International”, but over the past couple of weeks we’ve seen multiple pictures and videos of professional players giving them a whirl at Valve HQ. With that in mind, I wouldn’t be at all surprised if we saw the debut of Techies in the All-Star match. Then we can witness the sheer destruction this hero can wreak on the battlefield in the hands of a pro. 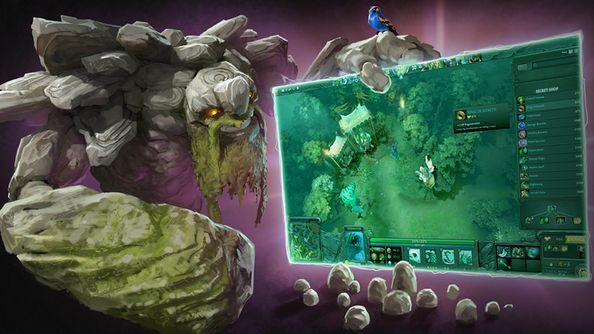 Dota TV: You can watch each and every single game from within the Dota 2 client itself. Here you can still enjoy your favourite casters, and even follow their perspective, but the real advantage of Dota TV comes with its freedom. You can choose to move the camera yourself, follow a particular player and even watch the match from their perspective and see their every move. And since it’s directly replicated inside the client, it’s definitely the best quality around. Twitch: Probably the most popular way to watch the tournament is through a live streaming service, the most used being Twitch.tv. Here you can enjoy the view from the casters, but you also get treated to the production Valve have set up. We’re talking interviews, draft analysis, crowd reactions and booth cams. If you want to get a feel for how it feels to be inside the Key Arena, this is probably the option for you. Newcomers Broadcast: This option is provided by both Dota TV and Twitch, but it focuses on giving a “noob friendly” approach to the matches. The casters will explain in detail heroes, abilities, items and decision making, all to make it easier to digest for those who are new to the game. If you’re just starting your Dota 2 career, this is the place for you. Dota 2 International Pubstomp: What is a pubstomp? Well if you’d prefer to watch the International with a beverage in your hand and in the company of friends/fans, this is where you need to be. Pubstomps are public events hosted at hundreds of bars and pubs around the world. Just head over to the Pubstomp listings here, and find a venue near you. We’ll be covering the main event as each day goes by, so don’t forget to check back here daily for day in reviews and more.